The Acts was made across the Christmas break of 2017-18. It is an experiment in live, biographical writing and call-and-response collaboration. It brings Reuters news feeds in to mark the place where each part was written against a wider global narrative. The Acts explores what it means to act, as in to perform, as in our ability to tell of a core of self at all. The Acts re-approaches 'The Act' as a grand section of gesamtkunstwerk rooted in Wagnerian tragedy, only re-accessed humbly through the now traditional scraps of Schwitters' holy fragments. The Acts tries - and ultimately fails - to break out of the promotional ways of telling the self that contemporary writing is framed by (although it hopefully fails better). The Acts is an attempt by two male working class writers to explore the necessarily fractured state of their subjectivities, and attempts only to show the deep cracks which shoot through both writers. The method of production - a kind of profane, riffing, open, lay analysis, operating through surrealist northern pingpong - is left at the surface. The Acts is Symptom as Politics. Richard Barrett lives in the north of England and likes watching films, reading, listening to music and going to the gym. 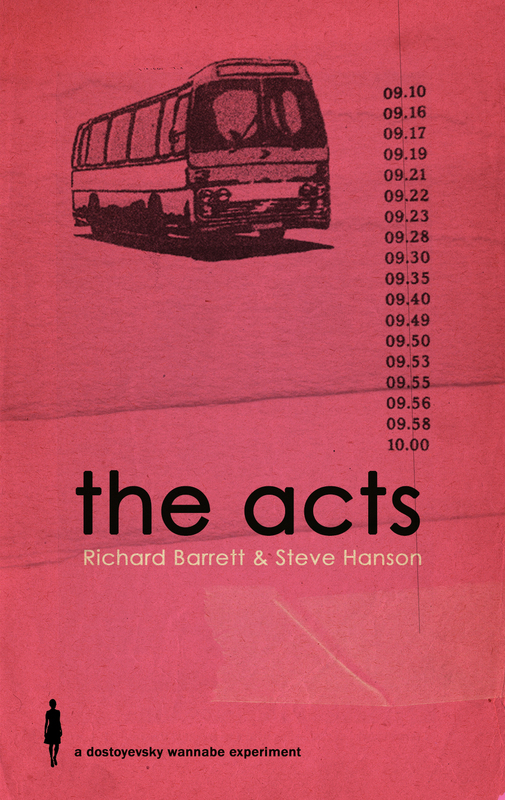 The Acts, which he co-wrote with Steve Hanson, is his first prose work. Steve Hanson is a writer scratching a living between hourly paid academic work and Universal Credit. He once had some business cards made.